I know it’s all about The Third Plate these days, but I have another dilemma in my house, namely the Third Piece issue. That is, in the meat-veg-starch triumvirate, I usually have the meat and vegetable down, but lately I’ve been stumped by what else goes on the plate that my brown-rice and bean-hating kids will be excited about, but that isn’t a big pile of potatoes. (I know, everyone should have my problems.) Sometimes I just go with meat and a double vegetable, but the other night I decided to grab two of the seventy-five cans of garbanzo beans I’ve collected in the pantry (How? Why? ), then drained, rinsed, dried, and fried them up in some oil before adding a few spices. And I think I might have found my answer. 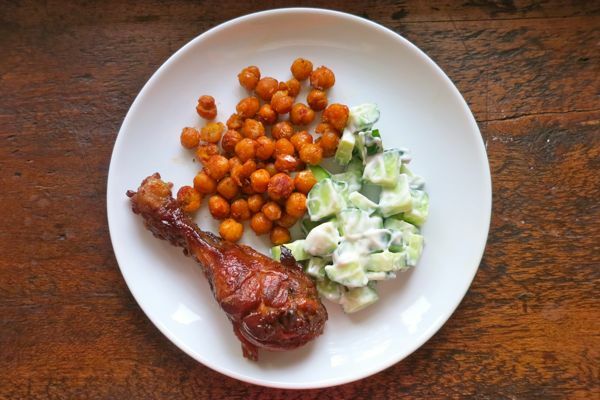 They were (somewhat) healthy, golden and crispy (read: appealing to the kids — probably because they didn’t recognize them as beans), flexible and can always be in the pantry, loyally awaiting dinner duty. Highly recommend if you have a few dozen cans in the pantry yourself. Add a generous amount of canola oil to a cast iron skillet set over medium-high heat. Drain, rinse and dry two 14-ounce cans of garbanzo beans. When pan is hot but not smoking, add beans (in batches, if necessary, you want a single layer of beans on the pan’s surface) and fry about 15 minutes per batch, tossing every 5 minutes or so. Remove with a slotted spoon into a paper-towel-lined bowl. Once all chickpeas are fried and drained, add salt, pepper, a pinch of cayenne, a 1/2 teaspoon of both garlic salt, and paprika, or (Bon Appetit-style) just smoked paprika and cayenne. You can also top with yogurt that has been mixed with a squeeze of lime juice and some freshly chopped mint or cilantro. Or you can stir in some chutney. Or you can offset the spiciness with a cool yogurty-cucumber salad. In short, go crazy. Speaking of chickpeas, I remember these Crispy Cinnamon Garbanzo Beans being the most addictive after school snack ever. And apropos of nothing: How good is The Third Man? I just added it to my Netflix queue — I don’t think I’ve seen it since the Orson Welles unit in college. The zither! We’ve really fallen in love with chickpeas. I love roasting them too, with salt and cayenne, then tossing them with lime zest and lime juice fresh from the oven. So good on salads. Or by the handful. Alton Brown’s method of cooking dried chickpeas in the crockpot is such a winner. The starch issue is a problem in my house too. My go-to solution is a baguette or frozen ” french-style ” rolls from the grocery store. 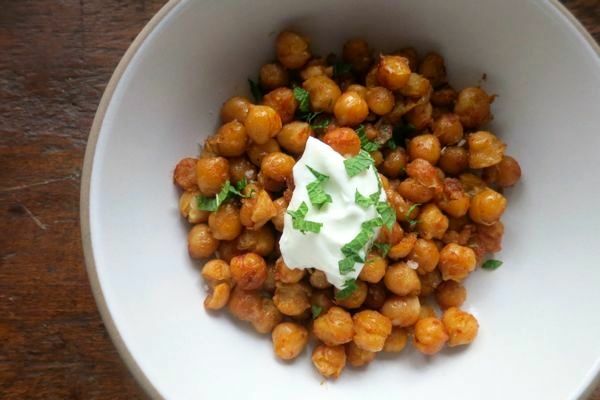 I like the idea of these chickpeas, especially since I have them laying around in my pantry too! I constantly have a starch dilemma, and also often resort to the two veg. I have potato-hating kids (unless of course they are fries!) So we are stuck with pasta, or Bittman’s lemon rice (I mix white basmati and brown rice). These chickpeas sound like a great option. My kids will eat them right out of the can…well right out of the colander after they’ve been rinsed…so why have I never thought to put them on the dinner plate? Thank you! And those other cans in your pantry are crying out to jump into your food processor and turn into yummy easy hummus! Yes! I literally have a CASE of them in my basement! i just adore crispy chickpeas! related: my boss keeps telling me to watch the third man — this weekend! My son would be very happy if we ate rice pilaf (middle east brand) every single night. our other go-to starches are roasted potatoes, buttered egg noodles, quinoa with feta, angel hair pasta with pesto, and farro (if i can find it). * Soaked brown rice: Measure rice into a large measuring cup and cover with cool water. Note the level of the rice in the cup. Add a splash of acid (rice vinegar is an obvious choice). Soak at room temp for 4-8 hours. Note the new level of the rice in the measuring cup — this is how much water it’s soaked up. Strain and rinse the rice. Cook as usual, but reduce the water by the amount that the rice already absorbed. Expect a much softer, lighter product than typical brown rice. i always think of beans as protein option, not as a carb. am i the only one? Love chickpeas! One of our go to summer staples is a chickpea salad. Gonna try this way too. I just did this last night, in coconut oil. Yum! YES, “The Third Man” is brilliant! Acting, directing, cinematography, suspense, location, MUSIC. Watch watch watch! Genius. I have like 8 cans that are taking up almost an entire shelf! What did I do wrong? Cooked longer but didn’t get crispy and they were popping out of the pan! My no-fuss potato alternative is white bean mash. Its a Nigella express recipe. Warm olive oil, rosemary, lemon zest and garlic in a pot. Add drained and rinsed white beans (cannelini, butter etc). Mash together, adding water as necessary, until heated through. Add lemon juice to finish. Super quick and tasty. Especially with steak and salad. Totally agree – I love chickpeas as a side. I always grab them when I don’t know what else to make, so I could help you with your extra cans (and if you could help me with all the canned duck products my husband won’t stop buying, please do!). Have you tried millet? I recently made it for the first time – it is not too exciting, but perhaps not too eew-inducing, either. Similar to couscous. I flavored mine simply: lots of pepper, salt, and chopped mint and cilantro. Could be better dressed, I’m sure.